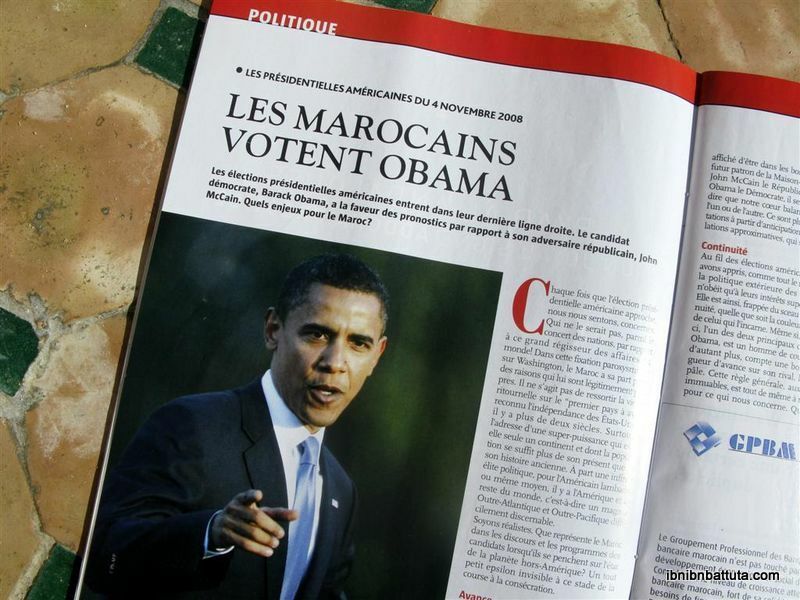 "Moroccans vote for Obama", at least according to MarocHebdo, one of the major local weekly news magazines. Back in the US, yesterday may have been my generation's greatest day, and I missed it. For nearly two years, I was completely immersed in the American presidential campaign while living in Washington, DC. 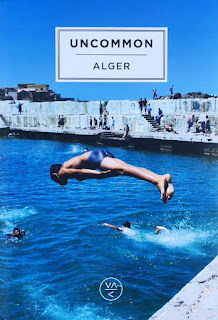 Since moving to Morocco in September, however, I've had to settle for watching from a distance as this spectacular race finally drew to a close. 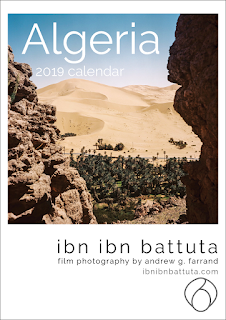 In Fes, as usual, misinformation was rampant in recent weeks, and what election-related "news" I received by word of mouth was uniformly absurd. Mostly, however, complete ignorance reigned. For instance, several weeks ago I asked a taxi driver—a self-described McCain supporter—what he thought of Sarah Palin, and received a blank stare in response. Never heard of her. stark generalities: "The Jews all support McCain", "The blacks hate immigrants", and "Whites will never vote for an African man." This Tuesday, in the middle of the night, we will know whether Barack Obama or John McCain will wake up as the Americans' next president. You might say: "What is that to us?" Believe it or not, we have a big stake in the election of the next American president. Because we are Arabs and Muslims (as everyone likes to point out), we are between a rock and a hard place: the rock of an imperial America which threatens and looks down on us on the pretext of "democracy", and the hard place of the Islamists who either execute us or recruit us under the pretext of fighting the great enemy—America. On Tuesday, the story of this tragic conflict will reach its end. We must proceed with the greatest caution. We who live in this way like schizophrenics, we must pay attention to the Americans. Why? Because America is all at once the greatest and the worst model. The greatest model because America invented modern democracy and freedom of expression. (Read their constitution—by God, I swear it will give you goosebumps.) The worst model because (despite their claims to respect the principles mentioned above) it has become, under the reign of George Bush the son, the pinnacle of hubris, arrogance, and violence. After they were attacked on September 11, 2001 (and 3,000 citizens killed is no easy thing) they replied with two wars. The first, in Afghanistan, was justified, but its implementation was terrible, and today Bin Laden and his cohorts are still at large. The second, in Iraq, had no justification at all. As for its results, it was and still is a tragedy for the millions of innocent civilians there. Over the course of five incomprehensible years, the Bush administration mangled America's image in the world in a way unprecedented in history. When the Islamists rise up and begin to curse America and chomp at the bit, even secular liberals [can be won over]... For precisely this reason, it is important to me and to all of you that the face of America change. In this respect, the November 4 elections are a wonderful opportunity. It appears that the American people are prepared to finally turn the page from Bush. In the last days of his rule, only 11 percent of Americans support their president. Whether Barack Obama or John McCain is the winner, neither one could be worse than Bush. Though McCain is old-fashioned in his thinking and conservative in his stance, and behaves a bit like a cowboy, he has great experience in the realm of international relations, and he knows the chaos Bush has created and will work to repair it. But if Obama wins... What should I tell you? A global revolution, just like that? The man worked with his fellow blacks in the ghettos of Chicago: he knows what degradation and oppression are. When he was young, the man studied in an Islamic madrasa in Indonesia: he knows what cultural diversity and respect for the other are. Open to the world, he is learned, intellectual, and smart. If he becomes the next US president, Obama could be a blessing to both his country and the world. And if he wins, as for those who would send us back to the Middle Ages in the name of their hatred for "the Great Satan" and its values, it will shut them up. And if they continue to speak up, they will surely lose their credibility. For this reason alone, this Tuesday, keep Obama in your thoughts and prayers. God knows he deserves it. Across much of the world—and the Muslim and Arab worlds in particular—public opinion strongly opposes the Bush Administration's reckless adventurism in the region, and Benchemsi's editorial exemplifies the international community's hope for a change in America's leadership. In a worldwide survey on Economist.com, dubbed the Global Electoral College ("What If the Whole World Could Vote? 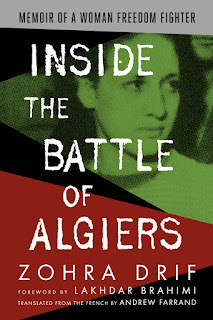 "), Obama garnered the support of 95% of Moroccan respondents, and about 85% of the worldwide total. The results of this informal global poll, while not scientific, nonetheless illustrate the overwhelming support that exists around the world for a fundamental shift in US foreign policy. Today, citizens the world around are overjoyed at the prospect for change which Obama's victory has brought. In Kenya, the homeland of Obama's father, jubilant locals danced in the streets when they heard their prodigal son had won, and the government declared a national holiday. I have dreamed of an Obama presidency for four long years, ever since the Senator's national debutante speech at the 2004 democratic convention. I was proud to cast my absentee ballot for him several weeks ago. Why? Personally, I am tired of traveling abroad and feeling like the citizen of an ugly America. In recent years, when I tell them I'm American, people in the various countries I have visited have generally reacted not with hostility but with disappointment. While American ideals remain the international standard of freedom, during the last eight years, American words and actions abroad have not measured up in comparison. Everyone knows it—America can do better. Today, that impossible fantasy of four years ago has come to fruition, and the fact that today I'm so far from the US makes it seem that much more surreal. But for many around the world, the message of Barack Obama's election is very real: Americans themselves know they can do better, and they've turned a better page already.